The following are artists, resources, websites, stories etc that have provided me with inspiration and ideas. I’m really drawn to his bronze work and the pieces that are optimistic about human companionship and reflect a warm vision of humanity. There are so many aspects to Louise that i love.... that she was still working until her mid 90's, that she was innovative and spanned installation art, expressionism and surrealism and that she used materials in such a profound way. 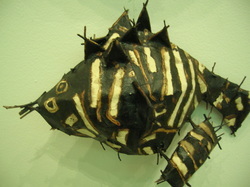 One of my favorite pieces is 'The Woven Child' made from fabric, wood, glass and steel in 2002. Very dramatic public works with installations often wrapped around existing structures, across both land and sea. They are big, bold, organic and use the topography of the structures in a beautiful fluid way...and the fabric is central and essential. "Wrapped Coast – One Million Square Feet, Little Bay, Sydney, Australia, 1968–69 was the first major environmental project created by the iconic artists Christo and Jeanne-Claude, more than a decade before they became famous for large-scale environmental projects at sites around the world. Wrapped Coast was the largest single artwork that had ever been made. Larger than Mount Rushmore, the expanse was so vast that no one vantage point allowed a complete view; instead, visitors walked for an hour to cross its surface. Two-and-a-half kilometres of coast and cliffs up to 26 metres high were shrouded in fabric and rope, appearing like a moonscape, alpine snowfield or Arctic terrain, transformed by sweeping winds into rivulets and billowing sails. " One of the first sculptors I came across that used an awareness of landscape, nature and ecology in his works in a subtle message about our impacts on, and relationship with, the environment. I really loved his early work with wood and the organic connection he made to the fragile and beautiful environments he was inspired by. Im draw very much to his use of materials ice, leaves, mud, snow, seeds etc...and the way he uses his hands and found tools to prepare the arrangements. I think Im more draw to the impermanance of many of his pieces and thoughts of decay and life. I also like that the site specific nature of his works means he can be seen in both the urban and more rural and natural settings. Photography plays a crucial role in his art due to its often ephemeral and transient state. I think originally it was the way he explored the human body and its connection to space at large, in a big way with large scale impressive installations. But then you see how he engages and transforms the subjective experience into a collective and active engagement. He's also not afraid and uses his own body, intimately, to express the space human beings inhabit. Anish Kapoor is public art at its finest, big bold monumental artworks with strong saturated colours. Whether its the experimentation with materials and forms, the vibrant colours or the distortion of space...his pieces are engaging. 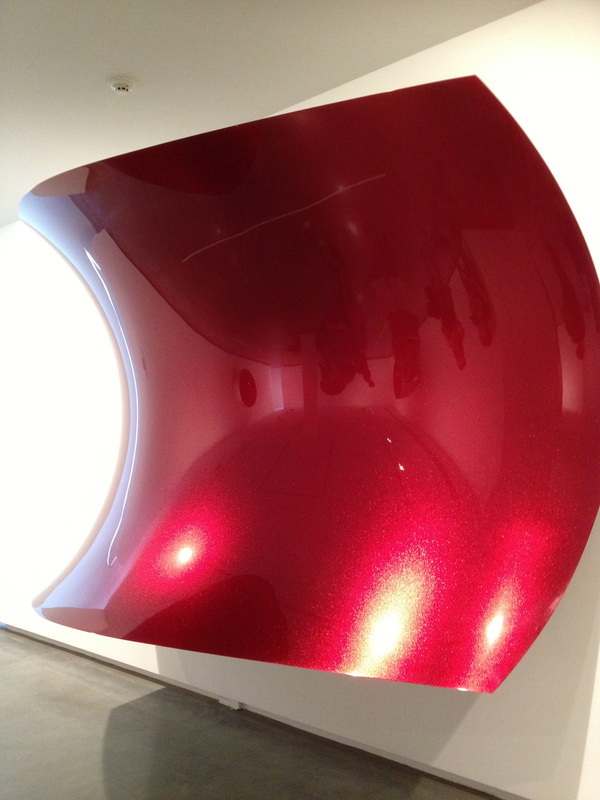 At at the recent MCA exhibition (March 2013), there was a diversity of surfaces. 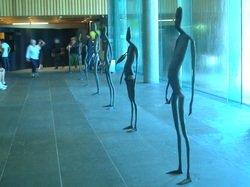 Some with a deep unreflective pigment, others a translucent resin and others contrasted with super-reflective surfaces. The pieces were full of contrasts, a fascination with darkness and light, presence and absence, being and non-being, place and non-place and the solid and the intangible. Ron's use of materials and techniques and knowing he refined his skills making puppets is enough for me. And..then you experience his work, ordinary lives and simple bodies and absolutely amazing. I came across Ranjani last year at NGV exhibition, Dewdrops and Sunshine. She has this amazing craftsmanship to her work and she uses all sorts of materials , wax, steel, wood, muslin etc and engineers these works across large spaces. While its very organic (materials help) its also very ordered and geometric and implies movement. I remember first seeing Michelangelo's David when I was 5 years old in Florence...the impression has lasted. But unlike me he actually performed human dissections in his early teens. A master sculptor of the human form creating anatomically perfect sculptures. "David is a symbol... as champion of a small, free community against the tyranny of greater powers. It is an ideal of courage and youthful confidence in a righteous cause, embodied in a figure carefully adjusted to the naturalistic view. The extraordinary power of assimilating study and skill as a workman have made it possible for the young sculptor to carry out together the conflicting impression of a young man, not fully grown, with head and hands too large, yet of a heroic form, and an energy fired by a great duty. The action... is momentary. The hand holds the piece of wood on which the sling is hung, easily, not grasping, but gently feeling for the proper hold. The sling runs round the back and its centre, filled with stone, is held with the left hand poised on the left shoulder, ready to be loosed. This movement, then, allows the expression of the face to be an important part of the whole story. The statue is too well known to say more; it is one of the great statues; the knowledge implied and the execution are both extraordinary, and yet one feels, somehow, that the youth of the artist is embodied in the youth of the statue. " Yep I was young and my first trip interstate with friends. I loved the whole experience but it was the sculpture park and the plaster humans scattered across the site that I was most in awe of. It hooked me and I still have the catalogue. 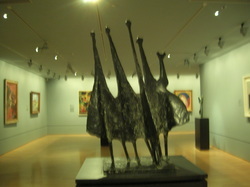 Loads of Mr Armitage and a Lynn Chadwick plus many that I now understand to be renowned artists.